My very first monthly spending and budget report for 2012. Its so embarrassing that I never reported on this for four months. The result of that was me losing my focus and off course I'm back to my straight and narrow. In the news this past three months, we made an offer on an amazing commercial property and the deal fell apart. Then we decided to upgrade on our home, and changed our minds. Here we are now, happy with our smaller, cheaper to maintain home. Our son wanted a swimming pool badly but he'll live. 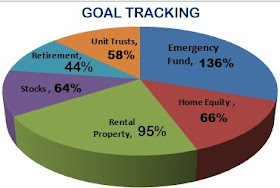 Real Estate 59% I am hoping to reduce this by increasing other streams of income. Hubby Allowance 31% He is so cute. Once off 9% Money my sister used for her emergency. Online 0% I keep a hold on my online income until its reasonable. In June I am getting the online income for a few months. I will only record then. Dividends 0% 2012 will be spent growing this and other interest. My online income is growing at a healthy rate. I'm also pleased that when my sister had an emergency, I was able to be a lender of an interest free loan. She gave it back in a month. Its great having a family. You get these interest free loans. She was very grateful, making this loan so very worthwhile. Real Estate 18.9% 1 mortgage & taxes/rates. Internet/ Phones 1.5% I manage to keep this very low. Consumer 9.9% Groceries, personal care and all that jazz. Withdrawals&Fees 0.4% This was a cash month. I withdrew cash twice. To Invest 50.4% So proud of me! And indeed I started my emergency fund which will soon be spilling over to my CD which we are laddering. From the unfortunate deal that didn't work well. I worked on an exciting plan of laddering a CD portfolio. I had some money which would be part of the down payment to the commercial property. I changed my mind on laddering this and dividing it into five pieces. My thinking is having it in my special savings account which will also serve as our emergency fund. I got a great 5.15% interest. However, if this goes to retail bonds, I can get up to 9% for a 5 year investment. I am just growing this amount so I can take anything between R100,000 and R200,000 by the end 2013 to retail bonds for 5 years, then another one in 2013, and another in 2014. This will leave me with 5 pieces for a period of 5 years each. The question is, will I be able to save that much in a year, going forward. I just have to commit to it. I had a vacant property for 2 months. This the first for me in 10 years. Its a very horrible experience. However, I hated the problems with the previous tenant even more. We signed an agreement for her to pay me what she owes in affordable payments over 6 months. I'm not holding my breath to receive all of it but I'm very glad the whole tenant-landlord relationship is over. I gave that unit to a real estate managing company. I've had enough with it. Its time I realize I am a real estate investor and not a property manager. Keep cool those in warm countries and warm to those in cold countries. I will try the weekly blogging thingy. I wish myself luck with that.